I recently stayed at the Embassy Suites in Dublin for business for 1 night. The rooms are modern and well equipped although the beds are only half of the new ones, you get the pillows but not the blankets which are the old Embassy kind. The lobby and staff are very nice. 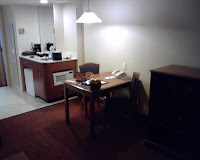 The room is your typical Embassy Suites room, comfortable and large with a living room and bed room with small kitchen for microwave and refrigerator. If you are accustomed to Embassy Suites you wont be disappointed. The best part of this hotel had to be the housekeeping. The housekeeper for my room was wonderful, even folding my clothes that I had left on the bed. 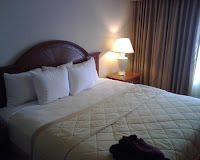 The hotel is very clean and very well maintained. 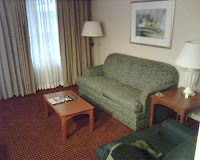 The furniture and carpet in the room are spotless.